I am Chief Scientist at WorkFusion, the leading human-in-the-loop automation algorithm and solutions startup. The concept driving the impact of our research team is simple: WorkFusion built a platform that integrates scalable workforce orchestration, the best in automation and machine learning pipelines, and rigorous statistical control and analytics for limitlessly general architectures and unstructured information sources. Our human computation platform gives us the power to reinvent human-in-the-loop and machine learning solutions for web scale language processing, real-world image recognition, crowdsourcing task management, and operations research. Separate from WorkFusion, I study satellite imagery and its applications using human-in-the-loop and crowdsourcing technologies. We build scalable and innovative technology in-house, and build strong connections to complementing technology and academic faculty. We hire individuals whom will drive our team further to build the information processors of the future. Reach out with an email to me at WorkFusion if you are interested in finding out how we are leading the research of humans-in-the-loop information science. Daniel Selva and I founded AgraSat, an international collaboration to channel the best practices of customer driven development to iterative design of nanosatellite architectures and mission systems. We identified key technological inflection points of emerging nanosatellite component that can bring to orbit hyperspectral remote sensing for specific industries. Agricultural and forestry practitioners, oceanographers, and municipalities, agree that nanosatellites providing multi- and hyper-spectral measurements with daily revisit time and 10m to 30m spatial resolution will radically alter the national landscape of these industries. With this goal in mind, we started conceptual studies for Agrasat-1, the first satellite of the series. Daniel Selva continues this project, which will have collaborators in Spain, Russia, and the US, and will include members from government, academia, and private organizations. Please reach out to Daniel and me jointly for more information on AgraSat. As a software engineer on the artificial intelligence team at Google, I worked on an exciting machine that will one-day learn by reading the web and answer deep knowledge questions akin to reading comprehension. This research team led by Joseph Francis at SUNY Downstate Medical Center is working on the incredible methods for connecting external machines to the human brain and creating data sources for neuroprosthetics by sensing the sensorimotor cortext. I loved working as part of this group of researchers and feel awe for the technology and its future impact. I have used non-invasive brain machine interfaces to move cursors on a screen and, let me tell you, it feels jedi. My dissertation research focused on high-contrast, high-angular resolution infrared imaging using a novel technique known as Non-Redundant Aperture Masking Interferometry with Adaptive Optics. My work focused on the advancement of the technique and the detection and mass measurement of brown dwarfs in binary systems, which provide empirical tests of brown dwarf and Jupiter-mass exoplanet theoretical (evolution) models. Similar techniques will be part of astronomical surveys aiming to directly image gas giant planets in nearby solar systems using new telescope imagers, such as the Project 1640 Integral Field Spectrograph, Gemini Planet Imager, and the James Webb Space Telescope. In short, we have entered the era in which a growing anthology of planetary systems are being discovered, analyzed, and characterized, and this is an amazing time to be a scientist! Previously, I used perturbative and numerical methods to predict that modifications to General Relativity are inconsistent with some pre-existing observational data of galaxy clusters and studied Early-Universe Cosmology. I had been a very active contributor to Cornell's Ask An Astronomer program, and I led the inaugural team that developed, wrote, and produced our new Ask An Astronomer Podcast series. I have also tried my hands at writing a proposal (prospectus) for a popular science book on exoplanets. I take the quality of science education very seriously and actively have tried to create opportunities to bring leading educational resources into my classroom and my department. I had been very active in outreach programs that target mentorship of K-12 students (Expand Your Horizons, Adopt-A-Physicist) and the communication of complex physics and astronomy to curious non-scientists. I had been very active in the administration of the Physics Graduate Society, and occasional contributed to larger University organizations. I also looked for opportunities to engage where my expertise may be able to contribute to science-informed policy decisions. I am a Philadelphia suburb native, living in New York City by way of a piecewise trajectory that has taken me through Cornell University in Ithaca, NY; Caltech in Pasadena, California; and a brief stint on Wall Street. My research and professional interests are described above. Each winter I'm waiting for the Phillies' opening day or playing my Fender Stratocaster in the hopes of getting that Bruce Springsteen sound. 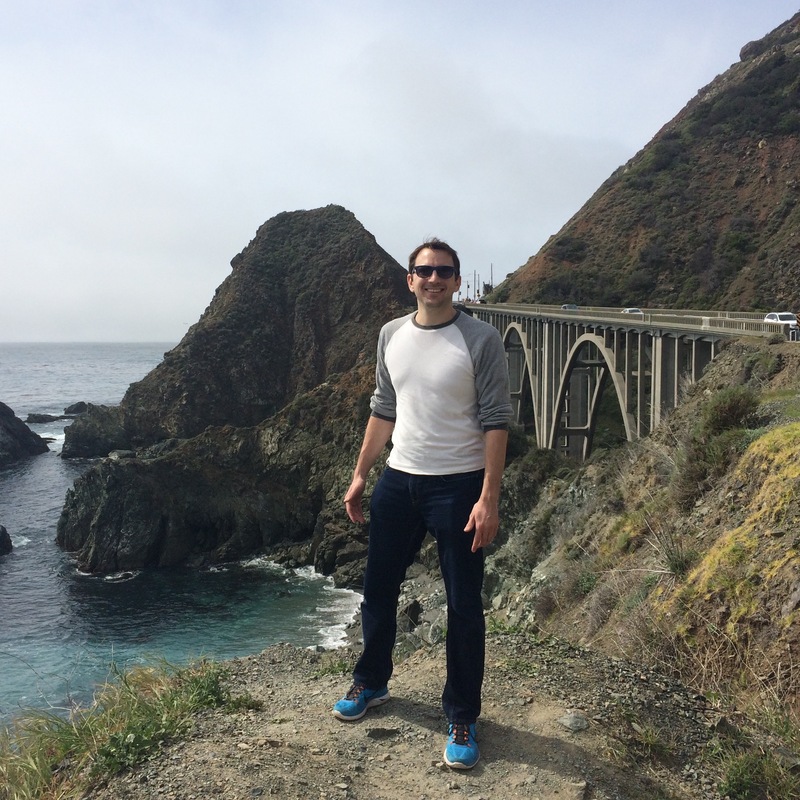 I'm in Big Sur, California, 2015.